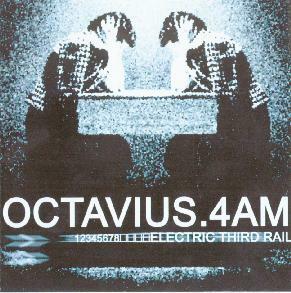 Octavius.4AM - "Electric Third Rail EP"
Octavius is primarily the group and assumed name of William Marshall. Octavius finds itself in two-person form on the "Electric Third Rail" EP. Marshall (vocals/programming) and artist 4AM (turntables/programming) integrate their abilities and insightful consciousness into this 9-track release. Also, there is additional production and creativity by Autumn Michaliszyn (additional vocals), Taron Barefield of Sleepover Disaster (provides additional samples) and John Wilson formerly of Meat Beat Manifesto (provides theremin, bass guitar and Ahru). Octavius' dwellings are currently in the San Francisco Bay area where the imaginative process unearths itself. From the beginning, it is clear that Octavius.4AM are not creating material to appease a distinct listening audience. With this said, keep in mind that its extremely difficult not to be swayed or encouraged to develop art without influences pushing you in a certain direction. These influences referenced to are the building blocks of an individual's creative development. In the likely case of "Electric Third Rail" there were no possible ways to escape previous influences no matter how clever or cunning one might have been when producing a body of work. It's important to indicate, though, that Octavius.4AM don't appear to become any of their influences nor do they detract from them. Simply, they build upon and encourage more interest in them while garnering awareness about their universe of sound (obscured and disconnected from the mundane). There is a camp of artists, small in numbers, who take pulsating textures and create patterns that are off kilter while retaining a forward momentum that nears obliteration and errancy but maintains a level of equilibrium to keep the listener curious of the next move made. Vocals immersed in a heavy wall of sound, grating ambience and rabid snares combine into one entity to allow for Octavius and 4AM to evoke many experimental tendencies. This piece probably nods more to artistic freedom despite leanings to pigeonhole its efforts. There's punk, hip-hop, jazz and the less generic underground world of music that continues to thrive and invite all walks of human beings. "Electric Third Rail" moves away from the cliques that have formed around the generic labels mentioned above and desperately searches out a path leading from the autism of invention that our world of music will continue to suffer from. I hope the spirit of certain masters: Sun Ra and Cage keep moving through each one of us, indirectly or directly. I feel, the ideology of these artisans (Sun Ra and Cage) have definitely made their presence felt on "Electric Third Rail." Spooky (Paul Miller) would probably be smiling. Keep increasing the audible bashing in order to cleanse the movement of artistic sterility. Octavius.4AM visit my town really soon. Information for Octavius.4AM can be obtained at: http://www.JustOneEnt.com. Email at: grivera@justoneent.com.